Rockets and Revolution offers a multifaceted study of the race toward space in the first half of the twentieth century, examining how the Russian, European, and American pioneers competed against one another in the early years to acquire the fundamentals of rocket science, engineer simple rockets, and ultimately prepare the path for human spaceflight. 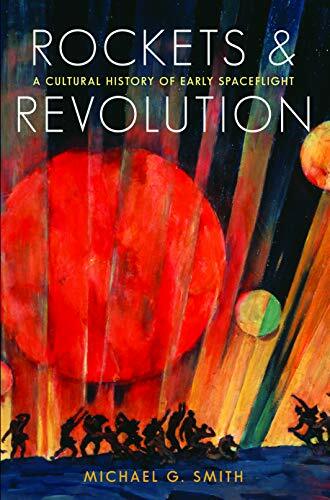 Between 1903 and 1953, Russia matured in radical and dramatic ways as the tensions and expectations of the Russian revolution drew it both westward and spaceward. European and American industrial capacities became the models to imitate and to surpass. The burden was always on Soviet Russia to catch up—enough to achieve a number of remarkable “firsts” in these years, from the first national rocket society to the first comprehensive surveys of spaceflight. Russia rose to the challenges of its Western rivals time and again, transcending the arenas of science and technology and adapting rocket science to popular culture, science fiction, political ideology, and military programs. While that race seemed well on its way to achieving the goal of space travel and exploring life on other planets, during the second half of the twentieth century these scientific advances turned back on humankind with the development of the intercontinental ballistic missile and the coming of the Cold War. Michael G. Smith is an associate professor of history at Purdue University. We're at 805 Caroline Street, in the heart of Fredericksburg's historic district. Open Monday to Saturday 10-6; and Sunday 12-5. In warmer months we stay open until 9 most nights, but you might want to call ahead. (540) 373-6148 Shipping rates are for Media Mail, in a padded envelope, without tracking. We ship orders valued at more than $50 in a box, at no additional charge. Priority mailing is for a Flat-Rate envelope, with tracking included. If the book does not fit into a flat rate envelope, we will likely need to request extra shipping costs from you, in order to put it in a box. We only charge the actual amount of shipping, so we hope you'll understand that it's just a matter of getting the book to you without taking a loss on it -- shipping is a service we happily offer without a 'handling' charge.... but we can't afford to charge you less than the cost of the stamps! Regular shipping by USPS Media Mail is $4. Shipping rates are for Media Mail, in a padded envelope, without tracking. If you'd like tracking, please let us know before you place the order. We ship orders valued at more than $50 in a box, at no additional charge. Priority mailing is for a Flat-Rate envelope, with tracking included. If the book does not fit into a flat rate envelope, we will likely need to request extra shipping costs from you, in order to put it in a box.